The title of the present piece suggests its intention: to function as a general melody that can be used to accompany any poem in the appropriate format, which in this case is four lines of seven character couplets ([7+7]x4), though the commentary says it can also accompany poems that consist of two lines of seven character couplets ([7+7]x2).4 The musical structure here does follow that of the four couplet structure, but in fact the music of the latter two couplets is only a small variation on that of the first two couplets, omitting some of the ornamentation, so the overall structure can be seen as ([7+7]x2)+([7+7]x2). As discussed under Cipai and Qin Melodies, it is interesting to consider the issue of pairing words and music in connection with the old concept regarding qi poetry. According to theory, ci lyrics originally accompanied a melody; the melody was subsequently lost, but people would still write poems according to the word count and tonal patterns of the original ci. It is fairly rare to find a qin melody with lyrics that fit an old ci pattern (see Surviving qin melodies and qin songs connected to ci patterns) and I have not yet found one that includes the instructions that the melody could be used with any lyrics following that pattern. On the other hand, both the 1573 and 1585 handbooks do have a melody called Xing Tan Yin the lyrics of which are structured (7+7)x2. These lyrics, included below (with my recording), first survive from 1525, where the melody is completely different. They are also included as part of the 1573 and 1585 versions of the learning exercise generally called Caoman Yin. Here the musical settings in the 1573 and 1585 editions are slightly different from each other but almost the same as the melody used for the first half of Shi Yin. On the other hand, there is in fact at least one other qin melody that was intended to serve as a melody for others in the same pattern. This is a piece called Qin Poem (Qin Shi), published in 1590 in Qinshu Daquan. A flock of gulls is all I see come each day. Today for the first time the rough gate opens for the gentleman. My poor home can offer only stale and cloudy wine. At the fence I'll call him, then we'll finish it off. Wang Di first transcribed this piece in her 琴歌 Qin Ge (1982, p.26), where she says the melody is from Chongxiu Zhenchuan Qinpu, but this edition includes only transcriptions and lyrics, not any tablature. Later, in her Xian Ge Ya Yun (2007; pp. 42-49) she has the same lyrics and music (correcting the relative tuning from 1 2 4 5 6 1 2 to 5 6 1 2 3 5 6), but she (or the book editor) identifies the piece not as from Chongxiu Zhenchuan Qinpu but only as "hand-copied qin tablature". However, the tablature there, though slightly different, clearly shows that this is the same melody as the one that occurs as Shi Yin in 1573 with the completely different Du Fu lyrics. Unfortunately, there seems to be no further commentary on this in either of Wang Di's books and so at present it is not clear whether this comes from another edition of the handbook, whether this was done by someone else some time later, or whether she applied the alternate lyrics herself. Xifeng created this piece so it would accord with the sounds of the lyrics, aligning seven characters for eight phrases and accordingly play to the end. If you want to play the seven characters for four phrases, then taking the first four of the eight phrases and playing them is appropriate. All poems whether having old or new sounds for their phrases can follow this method. Playing to the end is the same, and its flavor is endlessly beautiful (creative). The translation of this preface is tentative, but it clearly says that, although Shi Yin has the structure (7+7)x4, one can use the half of the melody for melodies with the structure (7+7)x2, and that the melody itself can be repeated endlessly without becoming boring. The fact that the presentation of the music in the second half is slightly different from that in the first half, plus the fact that the same handbook has another slightly different version for the melody Xing Tan Yin suggests that "無尽妙" might mean not just endlessly beautiful but endlessly creative. The Emperor’s countenance emerges from the nine fold palace as gracefully as an intoxicating heavenly vernal peach blow. Palatial birds soar high amidst the zephyr whiffles. Having presented poems teeming with gems of pearls and jades under their great literary flair of elan vital. This rarity is evinced by the only phoenix feather now prevailing over Phoenix Pool. The lyrics for 杏壇吟 Xing Tan Yin, discussed further above, are set to versions of this melody in 1573 and 1585. 暑往寒來春復秋。夕陽西下水東流。 Shǔ wǎng hán lái chūn fù qiū. Xī yáng xī xià shuǐ dōng liú. 將軍戰馬今何在？野草閑花滿地愁。 Jiāng jūn zhàn mǎ jīn hé zài? Yě cǎo xián huā mǎn dì chóu. The recording includes Xing Tan Yin as well as Shi Yin, as they are essentially the same melody. 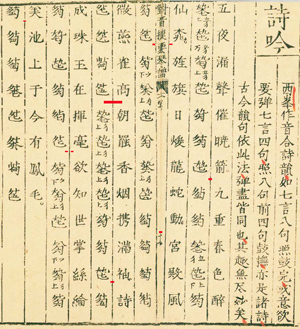 36260.46: 吟詩也 to intone poetry, adding only a reference ("喜有吟詩癖") to a poem called 送王尉歸觐 by 方岳 Fang Yue (1199 - 1262; Bio/307). Copied from an online electronic facsimile of the original, which is in the National Museum, Taiwan. The source of the red marks in the preface is unclear; I added the punctuation for the melody. Qinshu Daquan (1590) has a Qin Poem (Qin Shi) with a similar function. There may be more elsewhere but I have not yet found them. It is not clear whether this melody is intended to work for any poems with the character count (7+7)x4 or (7+7)x2 or whether the tonal nature of the individual words should be considered (see further under the footnote for the original preface). Could this melody (or a similar one) also have been used for longer poems using multiples of this structure, something not mentioned here? There is in fact evidence for traditions of using a repeated melody for singing/reciting long poems, but I do not know much about such traditions. Thus I do not know how to evaluate the source of, e.g., the four-line melody sung repeatedly in this YouTube example (thanks to David Badagnani for bringing it to my attention). Note that the four phrases of the melody mostly begin and end 6-2, 3-2, 2-1, 6-5, but near the middle (noting a section ending) and at the very end there is a single couplet that is 6-2, 2-1, i.e., ending on 1 ("do") instead of 5 ("sol"). According to Western music analysis the 5 keeps the music moving while the 1 denotes and ending. If that principle were followed in Shi Yin then perhaps the final phrase instead of ending on 6 ("la") could change to 1/do. The qin song Si Si Ge uses as lyrics an early (2nd c. CE) example of poetry using seven character lines. Although the repeated (7+7)x2 pattern here cannot fit the pattern there (which I interpret as [3+7]x1 + [7+7]x3 for each verse), the similarity of the Si Si Ge melody for each of its four verses suggests a similar attitude towards the pairing of words and music. The lyrics for this 1511 modal prelude have this same structure but unrelated music (further comment). This is also the structure of Wang Wei's famous poem, often set to music as Yangguan Sandie. However, all known settings of these lyrics (except 1511, which repeats 13 times the [7+7]x2 lyrics) add other lyrics as well; no known settings of Yangguan Sandie use a melody related to the present one. The first and fourth sections of this piece are also structured (7+7)x4, but the other sections have different structures. These lyrics have almost this structure. Settings for three Tang dynasty poems having this structure. Three pieces (Feiqiong Yin, Mei Hua [which I have recorded] and Ou Cheng) have the structure (7+7)x4, while Zhuzhi Ci and Si Qin Yin are (7+7)x2, as also is Ji Yinzhe in Toko Kinpu. None of these has music related to the music here. Several other pieces also have sections in (7+7)x4 or (7+7)x2, but as yet I have not found other qin songs using only one of these structures. In general it is my tentative observation that the melodies designed for use with multiple lyrics of the same pattern tend to be more straightforward than melodies accompanying only one particular melody. For example, the melody with Huangzhong Diao seems intended to hide the regularity of the lyrics rather than emphasize them. In addition to Wang Wei's poem just mentioned, there are probably lyrics in other Ming dynasty handbooks that fit the structure here, four 7-character couplets ([7+7]x4), but I have not yet located them. 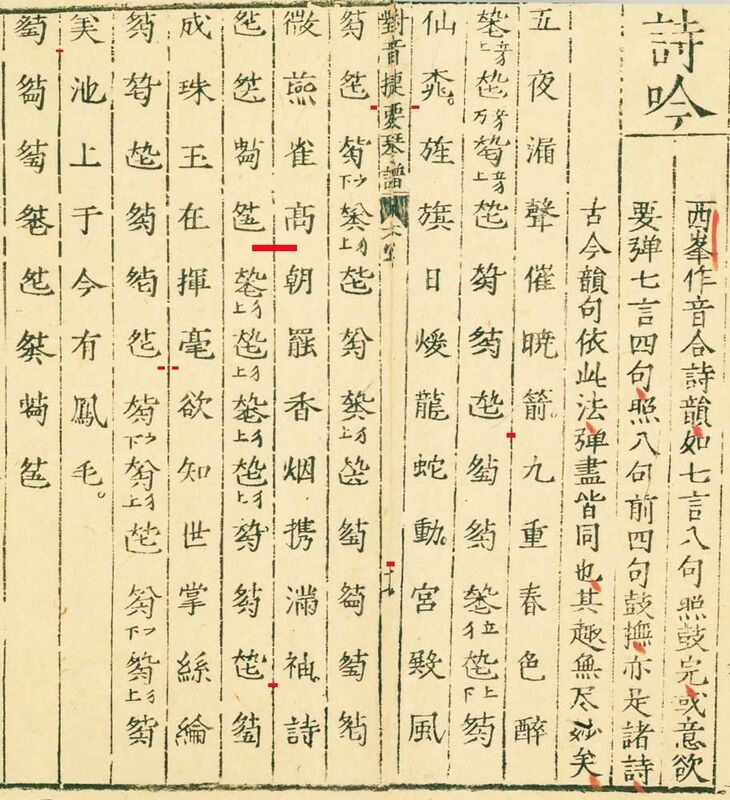 The source of the red punctuation marks on the online facsimile copy shown at top is unclear; thanks to Peiyou Chang for suggesting the punctuation change in my version above. I am still puzzling over the terms "詩韻" and "韻句", wondering if they suggest a connection between the qin melody and the natural melody of the poetry (not to mention the old 平仄 ping ze system).